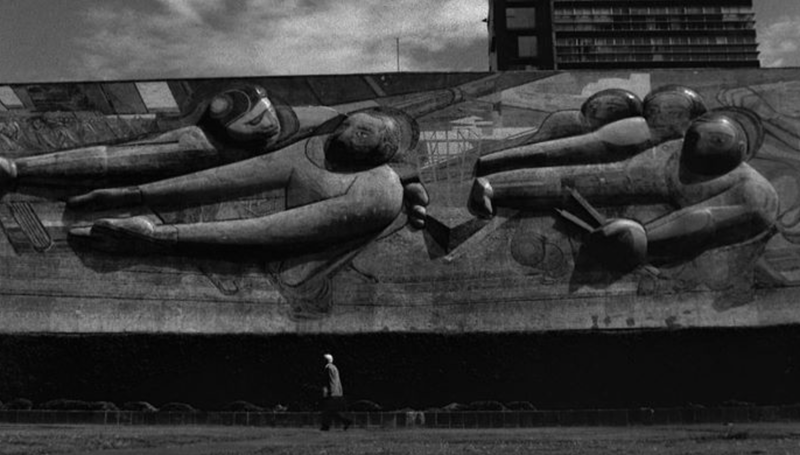 Den Anfang der Filmreihe macht der in Mexiko geborene Künstler Mauricio Guillén (*1971) mit seinem 16mm Schwarz-Weiß-Film „Avenida Progreso”, für dessen Produktion Guillén an den Ort seiner Kindheit und Jugend zurückkehrte. Guillén untersucht in diesem Werk soziale und kulturelle Unterschiede innerhalb einer Gesellschaft, die sich im Wandel befindet und doch noch immer vom Kulturimport der Kolonisation geprägt. Guillén war anwesend. Das Programm inkl. Gespräch dauerte 90 Minuten und fand in englischer Sprache statt. Mauricio, you used to live for a while in Frankfurt. Now, watching your movie „avenida progeso” with all its revolutionary hints and landmarks, I was asking myself if there is a certain correlation, or better, a kind a low-quality homage to the Frankfurter Schule, to the protests of the 68-movement around Horkheimer, Marcuse, Kracauer, Adorno and so on, which was a great impulse but finished in a failed hope, in an unsuccessful movement, into a resignation? If you really want to understand how something is working or functioning, the best way is often to dismantle or disassemble it in its components. In principle, it`s one basic tool of many essay filmmakers: maybe we can call it positive defragmentation. The word „constellation“ is thus one of the central terms in that context, coming from Adornos text „The essay as a form”, and its also one term, Gerd Roscher was reflecting about as a philosopher but also as a filmmaker. Constellation can be considered as a procedure of the essay filmmaker, its counterpart may be the composition. Would you mind to tell us a bit about your working process in terms of the narration of your movies? Within the frame of that movie series, we are trying to reflect on different strategies of narration, and here we are focussed on questions, dealing with time but also dealing inner and outer storylines. How would you describe your own conceptual approach on your storytelling, constructed around the of the old professor, Mr. Jocotot? The taxi trip may stand for a journey through time and changing ideologies, but how you came to the decision of telling your movie through an intern reflection process or thinking process? So this question here is more focussed of the inner content of „avenida progeso”. The word progress implicates a forward movement, and if we think about that from a more phenomenological angle, it is rather interesting to work on that topic by going back in the past. Translated into cinematic speech, well, by moving excerpts in the time line during the post production, you also work on (time-) perception, you can take influence on time in the way to distract or contract it. The term „Nullzeit“ means: There is no real and comprehensible progress of time within the movie itself. In your case, it doesn’t matter how long the taxi trip is or if the audience is aware about the driving time. The trip has a begin and an end and is supposed to be as short as possible for the professor cause he wants to come from A to B. But it also may be a very long trip, measured at the length of a reflection process of a certain depth. Would you agree that we have a „Nullzeit“, a time perception, where the detailed temporal expiration is unimportant for the reason of a certain „higher sense”? Roland Barthes called that thread of mixed different time layers „Verrücktheiten“, even though he was referring on photography. But what Barthes means with „fotografische Ekstase“ is not something else as a certain not softened or moderated experience of a time jump, a jump out of the own perception of time into an instant act of das Gewesene. But different as the static or immediate jump of the photography, a movie is fluid and dynamic. Looking at „avenida progeso”, I was suddenly thinking about the duality of the layers historical references (which in the narratology is called discours) and the story within the movie (histoire). The time structure is not circular in your movie (like for example in Vertigo) but kind of mutual. How would you describe your own handling with different time layers within your work? When do you think a story should be told in static images, and when moving images seem to be more appropriate due to their natures? In your works, but also in the „Césarée”, the absence is central. It`s about scratches and fissures in time, about the faded character of the human being, which seems not to have the ability to stop, but to slow down, this natural process. Is the video image, accelerated by the projector, the best way to document something which is not here, because of the self-referential fact, that what you see in the cinema is also not really there but only a perpetual effect or a steady impression? The moving image is also a permanent claiming of the presence, in other words, it interacts between the presence and the absence. The idea of the estrangement is used by Marx and is inspired by Hegel. It`s about the estrangement of the mind. In that context I would like to know, if the use or exploitation of found footage material can be seen as an estrangement of the original idea of an artist? Many artists, especially in the field of the essay film, work with material which is rearranged and reinteprated in order to underline a certain (new) message, which is not necessarily the same as the original concept of the author.